Trimble announced that its embedded RFID readers are being used as part of an inventory management system deployed by Germany-based fashion and lifestyle company Gerry Weber. Trimble’s ThingMagic M5e and M5e-Compact RFID reader modules power several components of the system including handheld scanners used for inventory, point-of-sale devices and electronic article surveillance gate antennas. 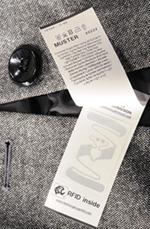 To streamline inventory and order management processes, Gerry Weber recently began embedding EPC Gen 2 RFID tags from Avery Dennison into the care labels of its manufactured garments. 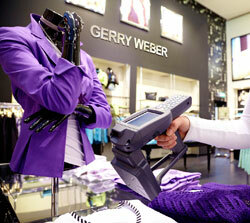 During the receiving process, Gerry Weber staff scans the RFID tags with Nordic ID PL3000 ultra-high frequency RFID Cross Dipole handhelds powered by ThingMagic M5e-Compact embedded RFID readers. The use of RFID for this inventory activity save store employees time and improves accuracy, as they no longer have to manually count items by hand or scan individual bar codes when orders arrive. At Gerry Weber, ThingMagic M5e embedded RFID readers also integrate with a RFID-enabled point of sale and electronic article surveillance system, designed by RAKO Security-Label GmbH, to automate purchasing and electronic theft-protection processes. The system automates the acquisition of sales information at the point of purchase and provides protection against potential shoplifters by detecting items leaving the store.